In but few characters was ever so happily blended all the elements of female virtues and attractions. Modest, refined, cultivated and dignified. Kine, forbearing, benevolent, liberal and just. To say "Thy will be done." This stone marks the resting place of one whose influence and character were felt in his day: a man of strong will and unwavering purpose, of untiring industry and unyielding perseverance, he made for himself fortune, name and position. And while his excellent sense and sterling character gained for him positions of public preferment, his warm and generous heart won for him friendship which will long offer a tear to his memory. May the sod rest lightly on his brave and noble heart. I just came across this post and your marvelous blog! 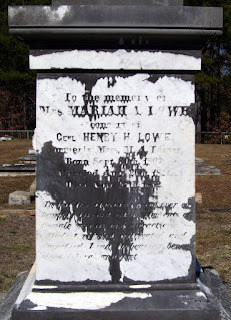 I'm a budding taphophilic blogger myself and just covered this grave. I'm glad to see someone else taking an interest in Southern cemeteries! Keep up the good work! Thanks, Lewis! I'm so very glad you've entered the arena, too. We need more southern gravers!